Ahh…the fights around the white board have ceased. A special thanks to the Step2 Company for sending me the wonderful Jumbo Art Easel for review as a part of their Step2 Ambassador program. This post may contain affiliate links. When my daughter was a toddler and preschooler, she hated finger paint. It took her a long time to get used to the texture and actually tolerate the paint on her hands. The triplets are the exact opposite (of course!). They love the mess and colors and everything else associated with this favorite kiddo past time. Don’t believe me? Check out the Handprint the Alphabet series that we’ve been doing this summer! 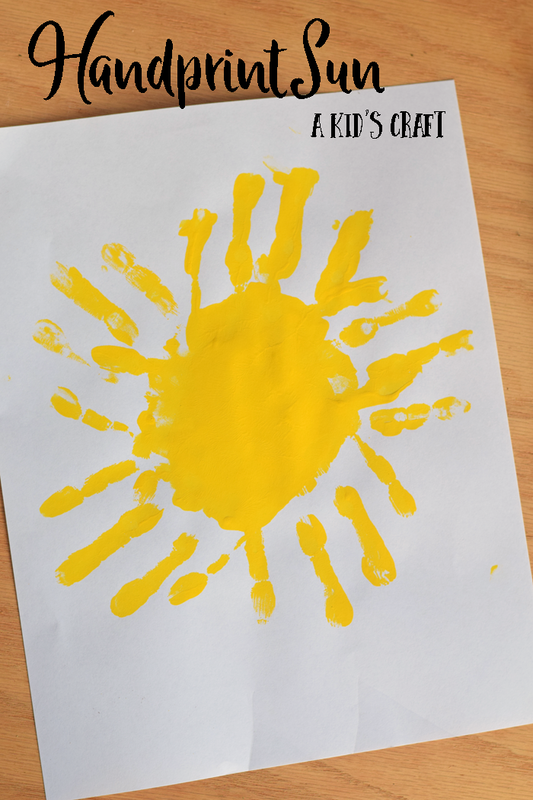 In addition to that series, we’ve been experimenting with other little handprint crafts, like this Sun Handprint Art. 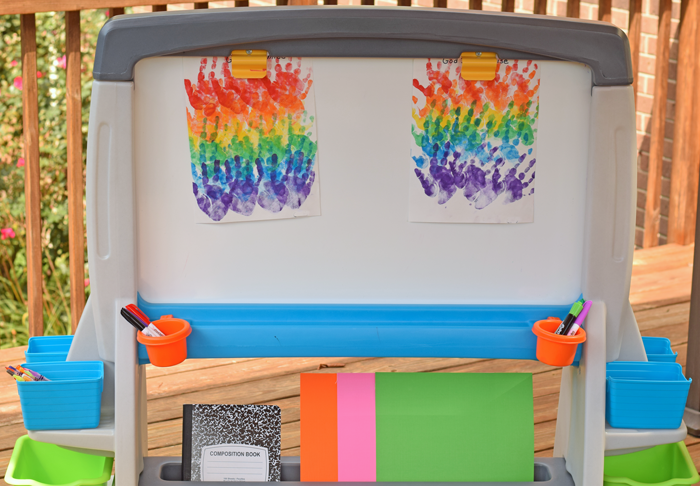 The Sun Handprint Art is particularly sweet for multiple little ones because one kiddo can do the project OR a few kiddos can add their hands to the same project. 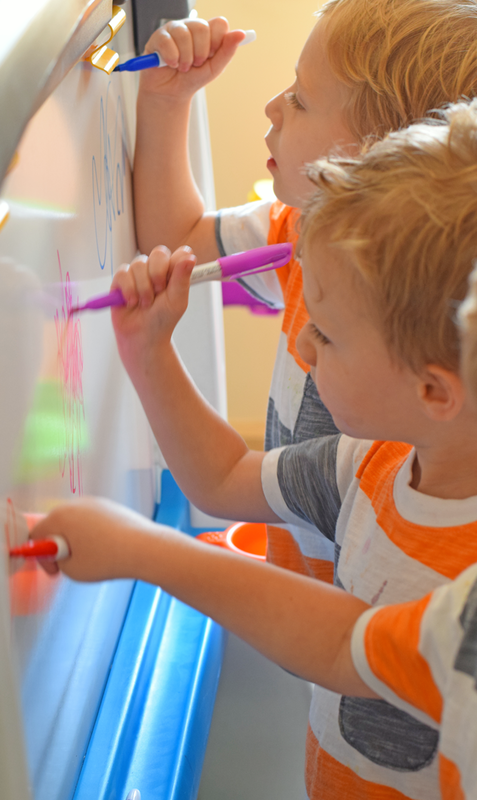 If you’ve never done handprint art with little ones before, pop over and read the Tips for Handprint Art with Preschoolers. Grab the white paper. 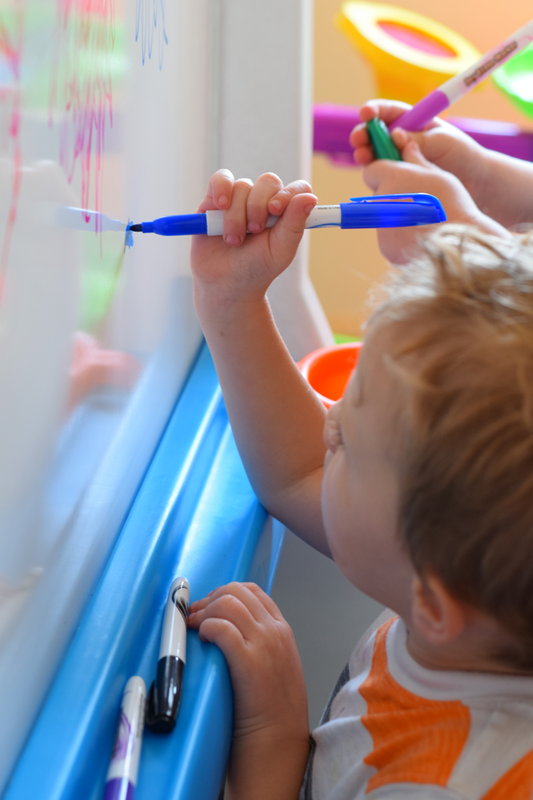 Using the paint brush, apply a thick layer of paint to one of your kiddo’s hands. Press the hand in the center of the paper. Continue this around, letting the fingers be the sun rays. Try to place the palm of the hand in approximately the same position each time. This is the part that, as I mentioned above, each kiddo can complete the sun by themselves or multiple kids can join the fun and make the sun a collaborative effort. 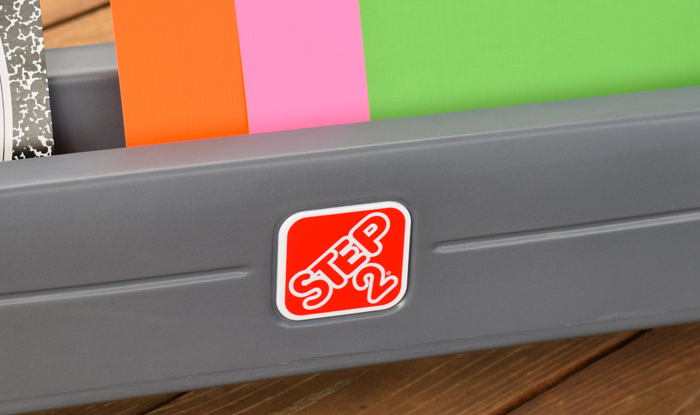 If your kids are obsessed with painting, drawing, and every artsy thing in between, you’ll want to put the Step2 Jumbo Art Easel on your wish list! Previously, we had a small tabletop white board. My mom found a stand-up easel and gave it to the boys, but there were still heated arguments over who should draw first and what-not. 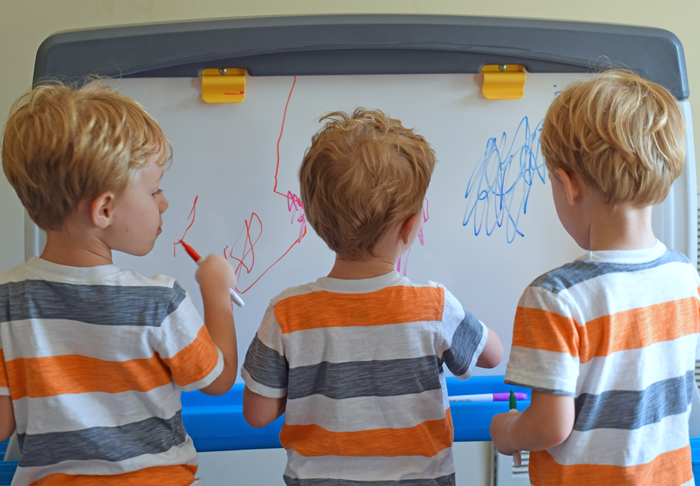 The Step2 Jumbo Art Easel is large enough for all three boys to use the same side of the easel simultaneously! 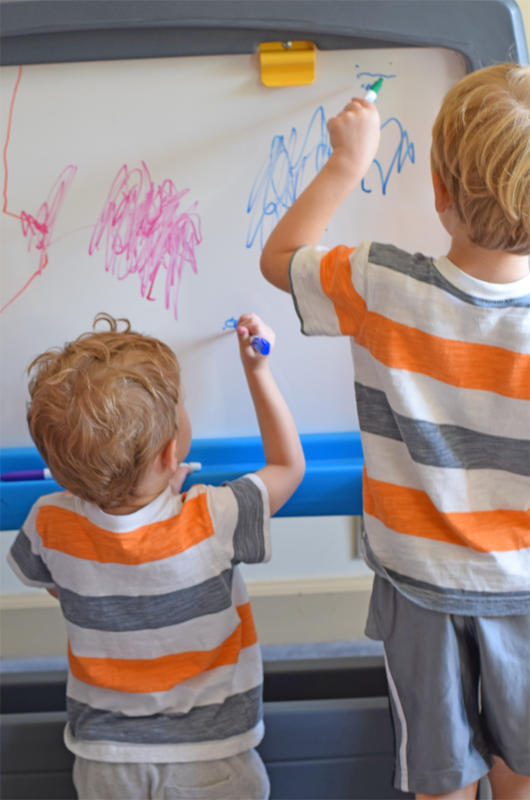 The easel has a white board on one side (which my boys seem to prefer), and a chalkboard on the other side. 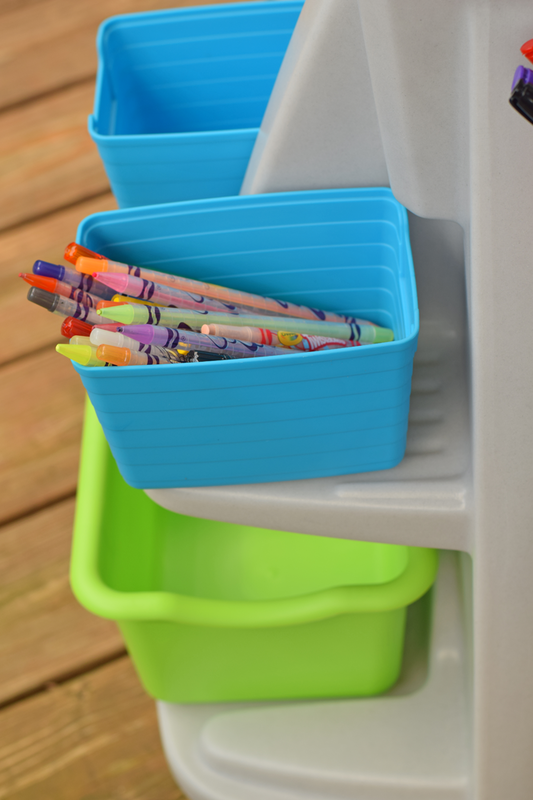 As a mom, I love the storage! 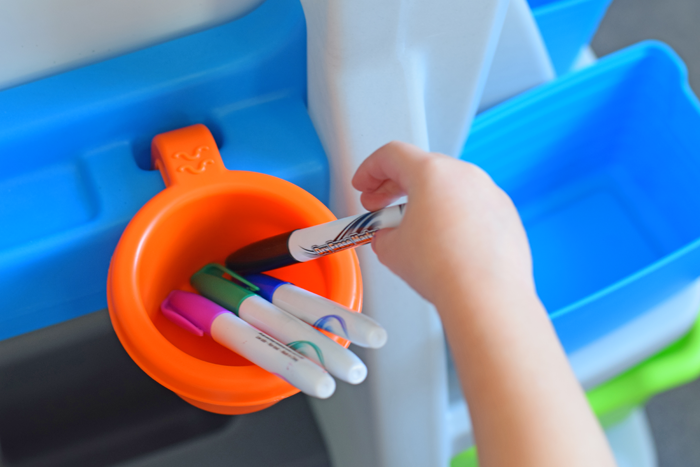 There is plenty of removable storage containers for pens, paint, crayons, glue, scissors, and everything else. At this point, I know what some of you are thinking. That’s the great thing about this easel. Unlike some easels where the supply storage is built into the easel, the storage on this easel is removable. 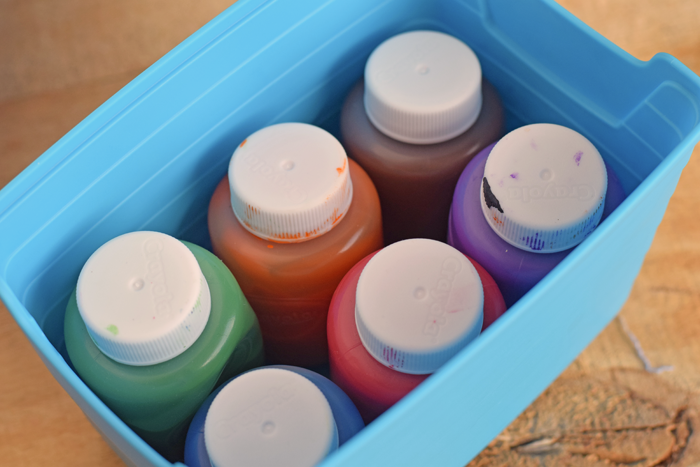 You can store paint and other items in the containers, place them in a closet or out of reach when not in use, and then bring them down to the easel when you’re ready for the kiddos to use them under supervision. The only non-removable storage pieces on the easel are the paper and book storage underneath the easel and the pen/chalk rows directly adjacent to the boards. I also like the paper clips at the top of the easel. I prefer these to the traditional paper roll that you’ll find in many easels. However, there are only two of the paper clips on the easel. These are both on the white board side. There are not any on the chalkboard side. 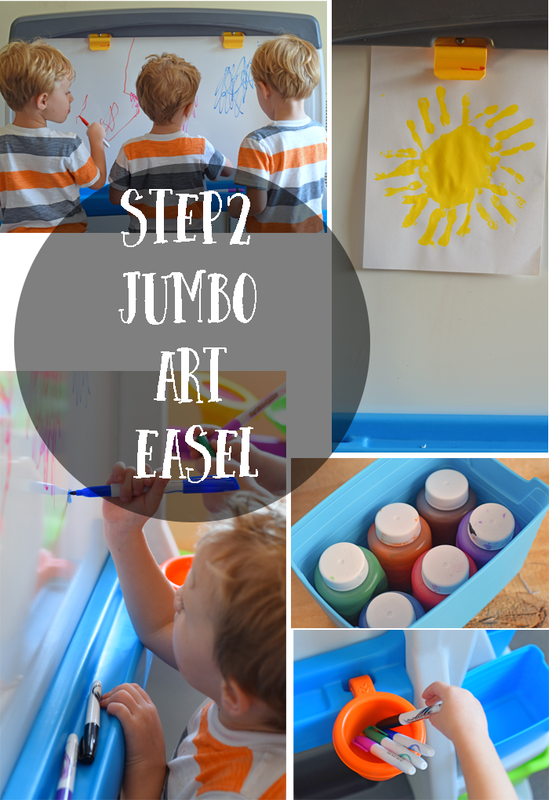 The Step2 Jumbo Art Easel does take up 49″ of floor area, but if you have multiple children who enjoy art projects, the product is well worth it! The easel fits easily into a space in our playroom.